Canadian photographer Donald Weber, has tonight, Thursday 26 April, been announced as a winner at the 2012 Sony World Photography Awards. Weber was crowned as the Sony World Photography Awards Current Affairs Photographer of the Year for his series Life in the Exclusion Zone. Donald Weber’s series was taken in Odaka, which lies on the northeastern coast of Japan. It was once home to 13,000 people, but today it is almost a ghost town. When the earthquake and tsunami of March 11 triggered blasts at the Fukushima Daiichi nuclear plant, a 20 km radius exclusion zone was imposed by the Japanese government. Within this zone, radiation emissions have been registered at four times the level considered safe for humans. Odaka is only 15 km north of the plant. A few days after the Exclusion Zone was created, Donald was one of the first photographers to document life inside the zone. Prior to photography, Weber originally trained as an architect and worked with Rem Koolhaas in The Netherlands. He freelanced for the international press and has since devoted himself to the study of how Power deploys an all-encompassing theatre for its subjects; what he records is its secret collaboration with both masters and victims. Weber is the recipient of the Lange Taylor Documentary Prize, a Guggenheim Fellowship and a World Press award, amongst others. Weber was presented with his prize of Sony camera equipment at the Sony World Photography Awards Gala ceremony at the Hilton Hotel in London’s Park Lane. The evening culminated with the announcement of American photographer Mitch Dubrowner as the winner of the coveted L’Iris d’Or – the 2012 Sony World Photography Awards Photographer of the Year for his extraordinary series of images, Storms. This is the second year in which the awards have been held in London having previously been held at the Palais des Festivals in Cannes. 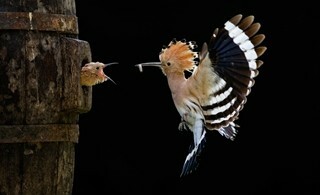 Over 112,000 images were entered into the 2012 competition from 171 countries – the largest number of entries to date. 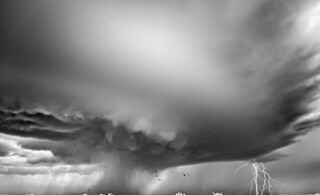 Dobrowner said at the awards, ‘In landscape photography, there is one moment that will never be the same again. I want my images to do the speaking. That’s what photography is all about’. Dubrowner grew up on Long Island, NY. As a teenager, he was given an old Argus rangefinder to play around with and after some research and seeing the images of Minor White and Ansel Adams, quickly became addicted to photography. Mitch enjoys creating images that help evoke how he sees the planet and says, ‘I feel that I owe much to the great photographers of the past, especially Ansel Adams, for their dedication to the craft and for inspiring me in my late teens. Though I have never met them, their inspiration helped me determine the course my life would take’. Dobrowner was chosen as the winner of the L’Iris d’Or by a panel of nine judges. In addition to a $25,000 cash prize and Sony’s latest digital imaging camera equipment, he is awarded the accolade of joining previous L’Iris d’Or winners Alejandro Chaskielberg, Tommaso Ausili, David Zimmerman and Vanessa Winship as a member of the World Photographic Academy. The Sony World Photography Awards Open Photographer of the Year title was awarded to Tobias Bräuning for his innovative and striking image Dancing Queen, in the split second category, a new category this year. Inspiration for his image came from pictures of simple water drops on a German DSLR internet forum. The 29 year old software engineer from Germany was awarded a $5,000 cash prize as well as Sony’s latest digital imaging camera equipment. Other announcements on the night included the professional category winners, covering the newly introduced Nature & Wildlife category alongside others such as Current Affairs and Travel. Among the winners are Peter Franck from Germany who, returning from his victory at the 2010 Awards, and after being shortlisted in four categories, triumphed in the Commercial campaign and fashion categories, and the UK’s Simon Norfolk, winner of the Photojournalism & Documentary People category, who is the author of books such as Bleed – based on the aftermath of war in Bosnia. The awards ceremony was attended by leading figures from the international photographic community, along with Minister of Culture, Ed Vaizey, speaking in support of the photography industry in the UK. The winning images and more will be on display at The Sony World Photography Awards Exhibition at Somerset House. Set in the stunning Embankment Galleries, the exhibition offers visitors an extraordinary range of contemporary photography covering a wide range of subjects from photojournalism and documentary to fashion, nature, architecture and sport. The exhibition, part of World Photo, London, is billed as the global photographic event of the year and the festival will also include a programme of events, talks, seminars and exhibitions. This year’s Outstanding Contribution to Photography Award went to William Klein; one of the 20th century’s most important and influential photographers and film-makers. With a career spanning the past 60 years, Klein, 83, has worked in painting, photography and film, always at the cutting edge of his chosen medium. Student photographer Asef Ali Mohammad from Middlesex University, UK, was announced as the winner of the Student Focus award that attracted entries from over 200 institutions across six continents. Asef used a Sony SLT-A65 camera to complete the brief, ‘Your world in colour’, that must evoke emotion through the choice of colour. His series of images about youngsters in Kabul were chosen as the winning entry over the other ten shortlisted photographers, landing Middlesex University the prize of 45,000 Euros worth of Sony digital imaging equipment. The title of Sony World Photography Awards Youth Award Winner went to Sergey Kolyaskin from Russia, for his image The Last Hero. Sergey was awarded with Digital SLR camera equipment from Sony and his winning image will be showcased at the winner’s exhibition. New for the 2012 Awards, the Youth Competition was open to anyone under the age of 20. The 3D Award, new this year to the competition, was awarded to Nick Saglimbeni from the United States for his stunning image, Nuclear Summer. Nick currently shoots many celebrity-driven commercial ad campaigns and he continues to be a pioneer in the world of both 2D and 3D photography. The competition was open to anyone using true 3D technology in photography or video and had two categories: ‘3D Panoramic’ and ‘3D Still’. The Moving Image Award went to Natasha Nicholson and Michael McDougall from Canada, for their short film Dead Languages. Michael has a background in design and moving image, whereas Natasha is a photographer. With combined sensibilities they were encouraged to work as a team to create a beautiful visual motion piece. It was also announced that the upcoming Focus campaign is ‘Youth on Assignment’. 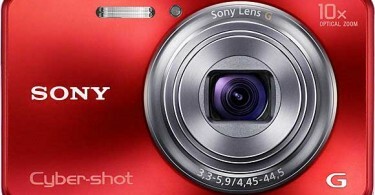 This will integrate student photographers with Sony’s CSR programmes in Sumatra, Argentina, South Africa, Malawi and others. Each one of these represents not only a very important philanthropic project, but also an opportunity for youth to be involved in real life humanitarian work, all documented through the power of photography.